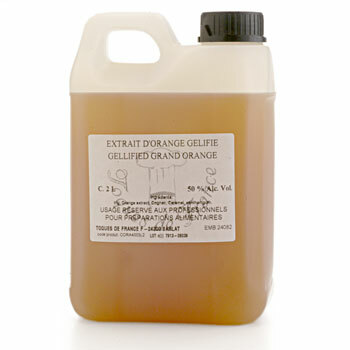 Concentrated orange extract obtained from a blend of natural flavoring extract (orange), Cognac A.O.C. and gellified neutral alcohol. Contains 50% Alcohol. Orange; Neutral alcohol; Cognac; Gelling agent: Xanthan gum E415; Coloring: caramel E150A. This Grand Orange Liqueur is meant to be used only in pastries, confectionery, ice creams and dessert recipes, and is CANNOT be used as a drink.